The US Census Bureau’s 2008 American Community Survey recently reported that Philadelphia has the most bicycle commuters per capita of the nation’s most populated cities. 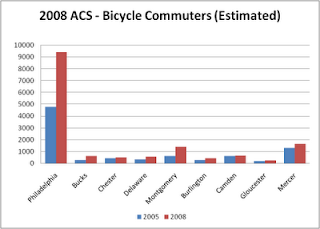 Philadelphia’s bicycle commuters comprised 1.6% of all commuters who travel to work. Among the nation’s ten largest cities, Philadelphia had the highest percentage of commuters who use a bike; higher than New York City, Chicago or Los Angeles. Philadelphia also tied for 10th among the country’s 60 largest cities and the second highest percentage among east coast cities (only Washington DC has a higher percentage). Philadelphia’s percentage of commuters who bike is nearly three times the national average of 0.55%. The 2009 American Community Survey found that the number of commuters who rode a bicycle to work rose from 4778 to 9410 between 2005 and 2008: a 97% increase in 3 years. This finding confirms the Bicycle Coalition's 2008 report, Double Dutch, that the number of bicyclists using Schuylkill River Bridges doubled from an average of 60 bikes per hour to 120 bikes per hour between 2005 and 2008. The news is also good for the Delaware Valley counties surrounding Philadelphia. While the steady climb in bicycling has been documented in Philadelphia since the 2000 census, bicycling in the region outside of Philadelphia remained stubbornly well below the national bike to work percentage. However, the 2008 ACS revealed double digit gains in 7 of the 8 suburban Counties. Overall, the regional increase was more than 75%, with Montgomery and Bucks Counties showing 122% and 130% gains respectively. Bike Pittsbugh's Erok Boerer developed a nice spreadsheet that breaks down bicycling, walking and transit use among the 60 largest cities. This is a great feature for anyone who wants move to Philly!. (So, I think it could be used a lot for Real State sales. I might need to sell mine next year, so for sure I would include this link in the advertisement! ).